Urea-formaldehyde microcapsules used in self-healing polymers (left). 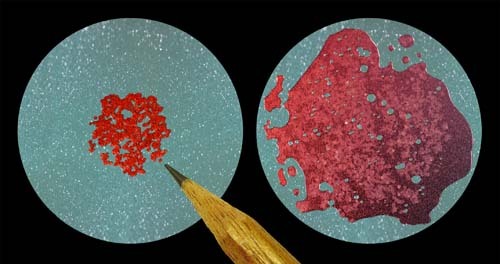 Red healing agent (dyed for clarity) is released when microcapsules rupture under pressure applied to a glass slide (right). The tip of a lead pencil is pictured for a size reference.